Transport Initiatives LLP is an independent transport planning consultancy, formed in 2005. Our four members all have strong in-depth knowledge of sustainable transport in general and cycling in particular. We specialise in innovative ways of developing and promoting sustainable transport options, covering every step from initial strategies and audits to managing implementation and monitoring outcomes. Our clients include local authorities, national parks, development bodies, Government Departments, train operators and anyone else requiring practical and achievable sustainable transport solutions. The Transport Initiatives team mainly developed their skills working in or for local authorities. They contributed to the work of Cycling England between 2005 and 2010. Our team are internationally recognised as being experts in their field. 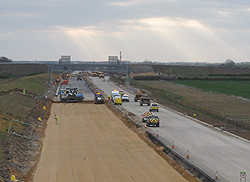 The A14 is being rebuilt on a new line between Cambridge and the A1 cutting across several local routes. Some mitigation measures have been included in the scheme but they don't tie into local needs very well. Transport Initiatives are investigating routes south of St Ives and taking the chance to tie local communities into the Cambridge St Ives Busway at the same time. Work involves measuring speeds and flows of traffic, minutely measuring pinch points and inspecting drains and ditches for crossing points. With the recent dry weather and the Blackthorn in bloom the job has made for some very pleasant site visits. We even got some birdwatching in; or were we just checking the footpaths? 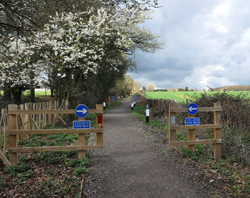 Transport Initiatives has been commissioned by Hertfordshire County Council to improve cycle access between Stansted, Bishop's Stortford, Harlow and the Lea Valley. Extensive planned development provides the need and the opportunity. We have reviewed myriad plans and policies, identified links and barriers and are now assessing options. One lengthy but pleasant route is between Stansted and Birchanger; the blossom looks lovely but the signing is overkill. A critical job will be to link this route to Bishop's Stortford over the A120.